Colorado River, make sure to stop by the head waters near Granby and Kremmling. The section of river between the intense rapids of Gore Canyon and the calmer waters near State Bridge offer the incredible landscapes that can ensure beautiful sunsets by the water. There are also great rafting trips to be had in Kremmling with AVA if you are looking for some excitement! If you are in Colorado to see the Rockies and to travel above 12,000 ft., make sure to take a drive over Independence Pass between Aspen and Leadville. This is the highest paved crossing of the Continental Divide in the United States. For another scenic drive, check out the peak of Mount Evans. This is a great detour if you are travelling from Denver and would like something more scenic than driving along the interstate. You can also walk from the parking lot to the top of this 14er (14,000 foot peak) within minutes. Near the Arkansas River, the Collegiate Peaks offer spectacular vistas near the beautiful river just near the Poncha Springs and the town of Salida. The Arkansas River is one of the most spectacular rivers in the state, so spend a day travelling down the river either on a raft or just enjoy the views and take a lunch break enjoying the river. Take a look at a different side of Colorado on the Flat Tops in northern Colorado. Head up the White River over the Flat Top Mountains and end up in the beautiful town of Yampa just south of Steamboat Springs. If you are staying in Colorado in the near future or just simply passing through, take the scenic route and check out the beautiful landscape of the Rockies. 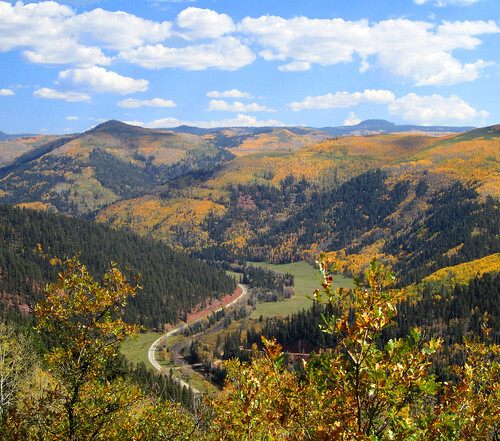 www.coloradoscenicbyways.com will provide you with all of the information you will need to plan a beautiful drive through Colorado.